Former U.S. President George H. W. Bush passed away late Friday night, 11/30, in his home in Houston, TX. Bush was 94 years old. His wife of 73 years, Barbara, passed away in April 2018. Bush served as the 41st President from 1989 - 1993. His presidency was marked by foreign policy. Notably the fall of the Berlin Wall in 1989, the collapse of the Soviet Union, and the Gulf War. He lost his reelection bid in 1992 to Bill Clinton. His son George W. Bush was elected to two terms as the 43rd U.S. President and his son Jeb Bush, former Governor of Florida, ran for president in 2016. 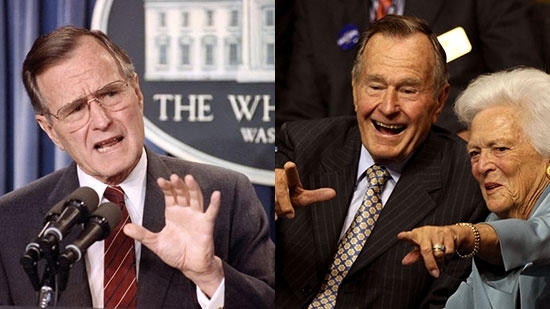 Bush was born in Massachusetts in 1924 and grew up in Connecticut. He enlisted in the Navy at age 18, six months after the attack on Pearl Harbor. He became a pilot and flew 58 missions during World War II. He married Barbara in 1945. After the war, he enrolled in Yale and studied economics. Following graduation, Bush moved the family to Texas and got involved in the oil business starting as an equipment salesman. He would go on make millions after starting his own oil business. Bush got his start in Washington, D.C. in 1967 after being elected to the House of Representatives. In 1970, he unsuccessfully ran for the Senate. President Nixon appointed him as the United States Ambassador to the United Nations from 1971-73. Bush then became the Chairman of the Republican Party in the wake of Watergate. President Ford appointed Bush to be Chief of the U.S. Liaison Office in the Peope's Republic of China from 1974-75, essentially acting as an ambassador, though the two countries did not have official relations. Ford then appointed Bush as the Director of Central Intelligence for one year in 1976. In 1980, Bush ran for the Republican nomination for president but pulled out of the race. He went on become Ronald Reagan's running mate and eventually the Vice President for two terms from 1981-1989.